PUMA has recently launched a new line of super cool, revolutionary products - PWR-C, or PowerCat. It was a prelude to the launch of the World Cup 2010 kits for PUMA's biggest team, one of the most PWR-ful in World Soccer - the World Cup Champions! This is one of our favorite jerseys so far. Reason being: it looks like something that traveled from the future. With its unique 'power' graphic (a very ripped robot) design on the front and back, and the collar style - like nothing ever done before. 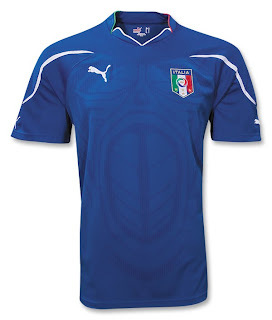 The jersey also features the official FIGC badge over the heart and embroidered PUMA cat logos, and "gli azzurri" is embroidered on the back of the neck. 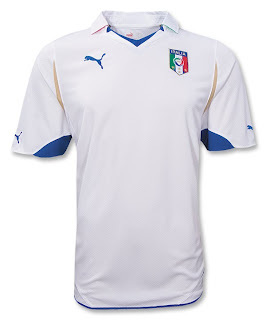 The Away jersey is more traditional, with its fold-over collar; yet it still showcases a style and class worthy of Italian football.